George Washington, known as the "Father of Our Country," was a farmer, military officer, and the first President of the United States. In 1753, at the age of 21 and with no previous military experience, he became a major in the Virginia militia during the French and Indian Wars. Within two years, he was in command of all the Virginia forces. In 1758, he was elected to the Virginia House of Burgesses and left the army in order to serve in the House from 1759-1774. He also served as vestryman in his Episcopal parish from 1763 to 1782. In 1775, Washington was appointed military advisor for New York and was charged with defending New York from attack by the British, and within weeks, the Second Continental Congresss appointed him Commander-in-Chief of the entire military. Washington had not sought the position and he refused payment for it. In 1781, he forced the surrender of Cornwallis at Yorktown and won the war. He was President of the Constitutional Convention of 1787, and served two terms as first President of the United States under the new Constitution. 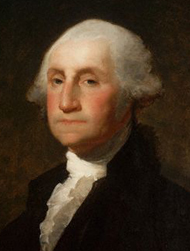 He declined to serve a third term, and retired to Mount Vernon in 1797 where he died of pneumonia two years later. "I now make it my earnest prayer, that God would have you and the State over which you preside, in his holy protection, that he would incline the hearts of the Citizens to cultivate a spirit of subordination and obedience to Government--to entertain a brotherly affection and love for one another, for their fellow Citizens of the United States at large, and particularly for their Brethren who have served in the Field, and finally, that he would most graciously be pleased to dispose us all, to do Justice, to love Mercy, and to demean ourselves with that Charity, Humility, and Pacific temper of mind which were the Characteristicks of the Divine Author of our blessed Religion, and without an humble imitation of whose example in these things, we can never hope to be a Happy Nation." “Such being the impressions under which I have, in obedience to the public summons, repaired to the present station, it would be peculiarly improper to omit, in this first official act, my fervent supplications to that Almighty Being who rules over the universe, who presides in the councils of nations and whose providential aides can supply every human defect; that His benediction may consecrate to the liberties and happiness of the people of the United States a government instituted by themselves for these essential purposes; and may enable every instrument employed in its administration to execute with success, the functions allotted to his charge. “In tendering this homage to the Great Author of every public and private good, I assure myself that it expresses your sentiments not less than my own; nor those of my fellow citizens at large, less than either. “No people can be bound to acknowledge and adore the Invisible Hand which conducts the affairs of men more than the people of the United States. Every step by which they have advanced to the character of an independent nation seems to have been distinguished by some token of providential agency.